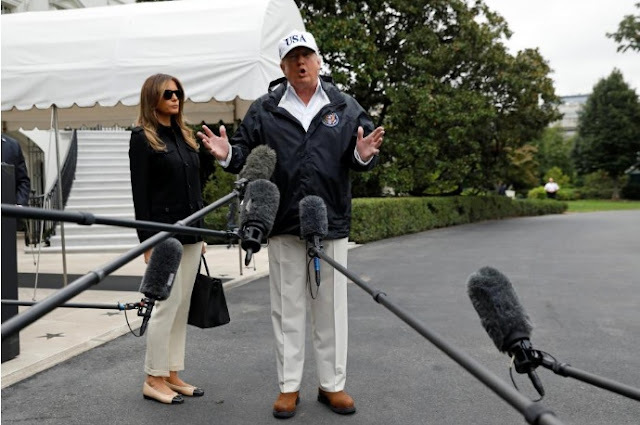 U.S. President Donald Trump speaks to reporters as he and First Lady Melania Trump depart the White House in Washington on their way to view storm damage in Florida, U.S., September 14, 2017. FORT MYERS, Fla. - U.S. President Donald Trump arrived in storm-ravaged Florida on Thursday to survey the damage wrought by Hurricane Irma, the second major storm to hit the United States this year, which killed dozens and has left millions without power. Trump’s visit comes the day after police in Hollywood, Florida, launched an criminal investigation into a nursing home where eight patients died after the facility lost power and continued to operate with little or no air conditioning in sweltering heat. The death toll from Irma stood at 81 on Thursday, with several hard-hit Caribbean islands including Puerto Rico and the U.S. Virgin Islands accounting for more than half of the fatalities. Florida officials including Governor Rick Scott and U.S. Senator Marco Rubio greeted Trump and Vice President Mike Pence in Fort Myers, Florida. The president was due to meet with officials running the disaster response before heading to Naples, near where Irma first reached the mainland United States on Sunday. “Let’s go see how we’re doing because I think we’re doing a good job in Florida,” Trump told reporters in Fort Myers after fielding questions about a potential deal with Democratic lawmakers on protections for illegal immigrants brought to the United States as children. The visit marked Trump’s third visit to a storm-hit part of the United States in the past three weeks, following two visits to Texas in the wake of Hurricane Harvey’s record flooding. It was seen as a clear bid to avoid the criticism that Republican President George W. Bush received for his administration’s slow and inefficient response to 2005’s Hurricane Katrina. Hollywood, Florida, officials said eight people between the ages of 71 and 99 died at the for-profit Rehabilitation Center at Hollywood Hills, but the causes were not yet determined. An investigation of possible criminal negligence was underway, Hollywood Police Chief Tomas Sanchez told reporters. Some 3.1 million homes and businesses, representing close to one-third of the state’s population, were without power on Thursday in Florida and neighboring states. Some 20 percent of Florida’s gas stations had no fuel on Thursday, down from a peak of 46 percent, according to fuel information service Gas Buddy. About 25 percent of homes in the Keys were destroyed and 65 percent heavily damaged, according to federal officials. The Keys stretch nearly 100 miles (160 km) into the Gulf of Mexico from Florida’s southern tip, connected by a single highway and series of bridges. U.S. President Donald Trump arrived in storm-ravaged Florida on Thursday to survey the damage wrought by Hurricane Irma, the second major storm to hit the United States this year, which killed dozens and has left millions without power.